It’s Not Too Late to Register for the The World of Water! 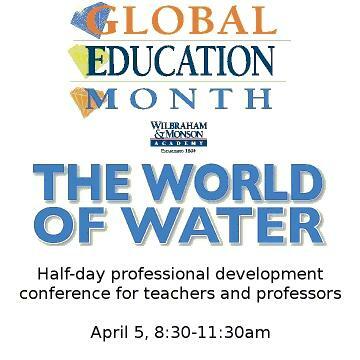 It’s not too late for you to register for The World of Water: a local education and professional development event sponsored by Wilbraham & Monson Academy. At this event, teachers and professors will have opportunities to explore how to connect water topics to Massachusetts curriculum standards. Guest speakers will include a keynote from Fabien Cousteau, Brain Lapis of WWLP-22, and Carl Hodges, Founder and Chairman of the Seawater Foundation. To register for the half-day conference, visit the WMA website. This entry was posted in Local Events, Teaching Tools and tagged WGBY, Wilbraham & Monson, world of water. Bookmark the permalink. far down in the search engine rankings. What’s google’s deal recently? Websites such as this one should be at the very top. … not Six pages deep. It’s total nonsense!